… all for less than $100! Thank you to all my Instagram and Facebook followers that voted on your favorite fabric! I went with the top pick… which happened to be my favorite as well. 2″ foam= $27.22 (After 50% off coupon) I know! Who knew foam was so expensive? If I hadn’t had my coupon, it would have been $54.44… over half my budget! Thanks for following along. This has been such a fun challenge. 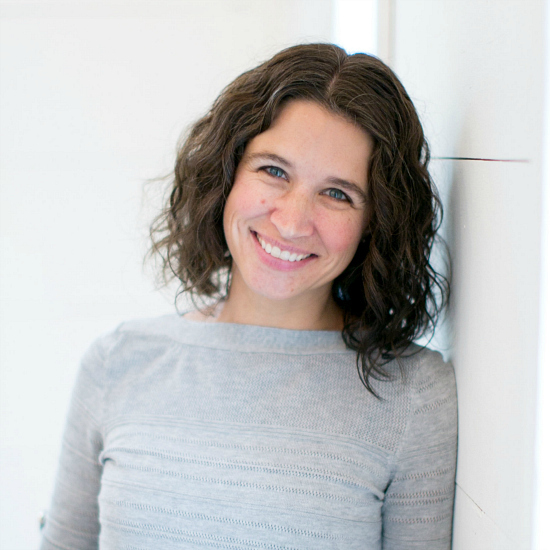 I hope you’ll all join me next month as I start a whole new space! 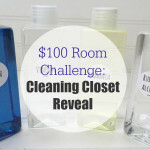 If you are interested in trying your own $100 Room Challenge, I’d love to see what YOU come up with. 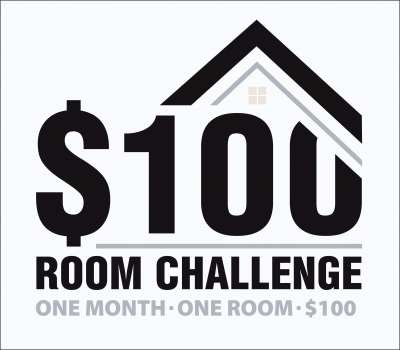 Email your before and after photos to me, or use the hashtag #100DollarRoomChallenge on Instagram and Twitter! I love how real your spaces look. I have to force myself to stop checking out your site every 5 minutes. You have some really great ideas. 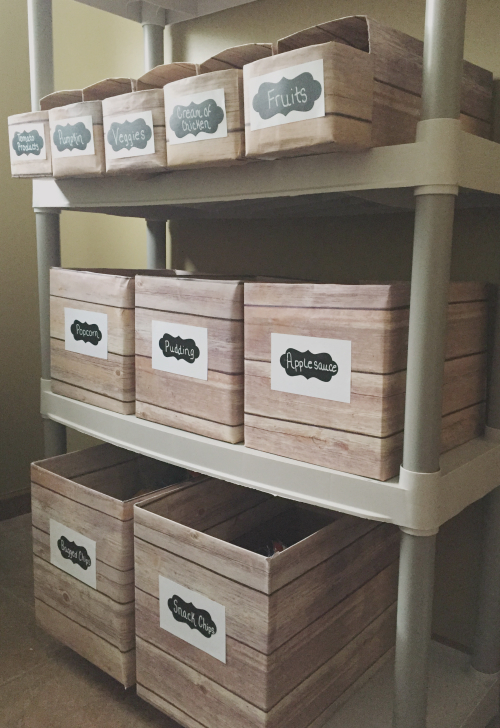 We are moving into a new home in a couple weeks and I’ve been trying to sort out some new storage solutions for the new space. 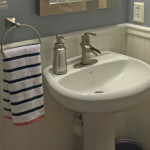 I have loved reading through your budget friendly ideas for al your rooms! 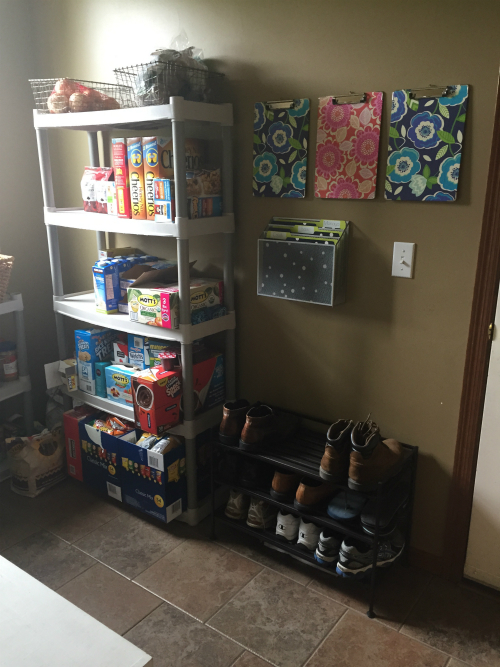 I’ll remember to make a goal list and definitely look into dollar store bins for areas like the new pantry and laundry that don’t have to storage space I am used to. Thanks again! I love transforming dollar store bins. It’s so easy, and you can spray paint them whatever color suits you. Good luck with your move! Love your bench! Did you make the whole thing or just the cushion? Where did you get the bench if you didn’t make it? 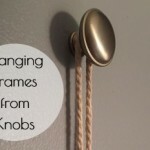 This is exactly what I need for my mudroom/laundry room. My husband actually made the bench, and I made the cushion. He made it long before I started blogging, so, unfortunately, I don’t have any plans or tutorials on how it was made. Wish I did though. Looks great. I noticed the washer hookup on the wall. where is your washer and dryer? thanks. It is SO much better! The room was an accident waiting to happen. So glad I was able to get it organized and it feels so much better walking in. Thanks for stopping over Jenny! So Erin, when can you come over to my house! What a great job!! And I see where that lovely pattern went. YOu definitely made the right choice. Thanks Mary! Someone on Facebook asked me the same question about coming to their house. I told them if they wanted to pay my airfare, I’d gladly come organize their house. For you, that might be a bit much 🙂 Have a good night Mary! Thanks for stopping over! This is awesome Erin! Amazing what you can do for under $100 when you challenge yourself and think out of the box. Love this challenge. Excited to see what room you do next. Thanks Tiffany! I loved trying to do the room on a budget (a very small budget). I’ll have the new space up on Oct. 7th!!! Looks amazing, Erin! Of course, I’m totally thrilled with your fabric choice. I love the contact paper boxes and dollar store bins. I’m sure your family loves the new space–well done! Love what you did!!! So organized! 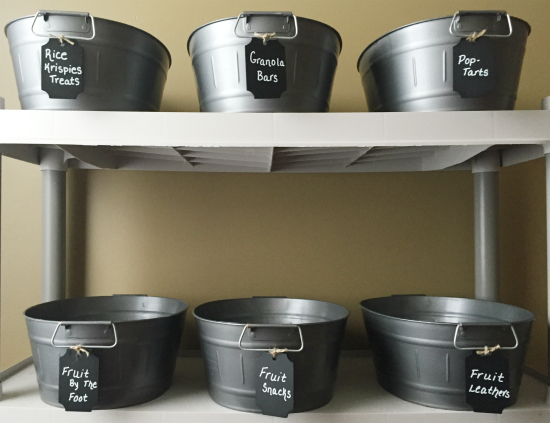 Now maybe this inspiration will motivate me to do my pantry. Thanks for the ideas. Wow! Just wow!!! I love every part of this room and definitely going to be using lots of your ideas in my pantry too. Great job staying under your $100 budget…you rocked it! Thanks Sydney! I realized that if I hadn’t made that cushion, I could have done the whole thing for only $35. Pretty crazy! This was such a fun challenge. Thanks for following along! Wow! You made a huge difference with such a small budget. 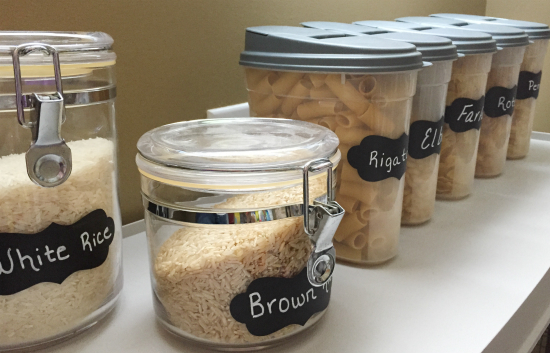 I really love all the different containers you DIYed. Thanks Amy! While I would have loved a pantry full of beautiful glass jars, I knew my budget would be out the window in about 2 seconds that way. 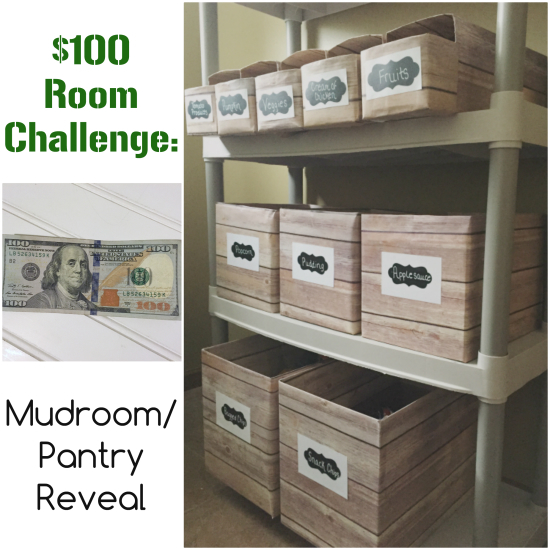 This challenge forced me to get a little creative and think outside the box, and I loved it! Thanks for stopping over. Enjoy your day! Very well done, Erin. Fun to watch the transition! Your ideas are inspiring. Erin this turned out great! I can’t wait to see it in person next week! Foam is super expensive isn’t it? You have to find it on sale when using it for a project! 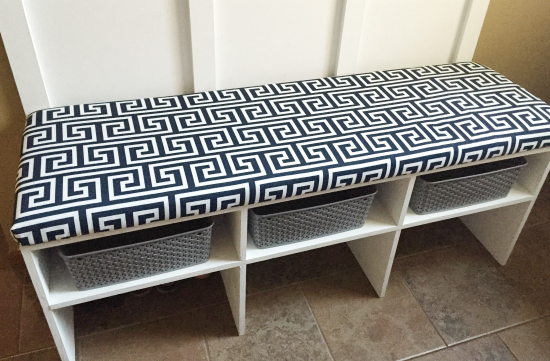 I used it for my ottoman makeover! I love the fabric you chose! The whole room looks great and so organized! 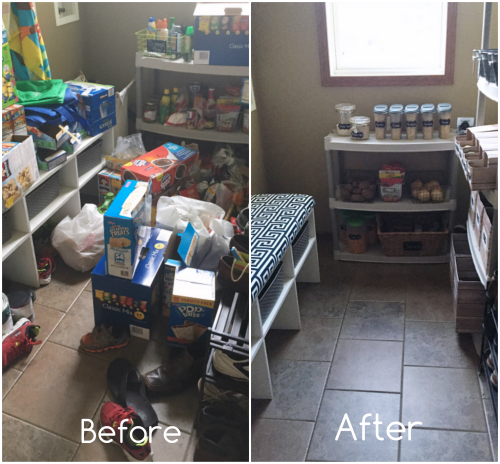 You’re inspiring me to makeover my pantry! Thanks SO much! It was definitely challenging to make it all work on a budget, but SO fun. And, seriously, what is up with foam? I did not, in my wildest dreams, think it would be so expensive. Thank goodness for coupons!!! This is a huge transformation! 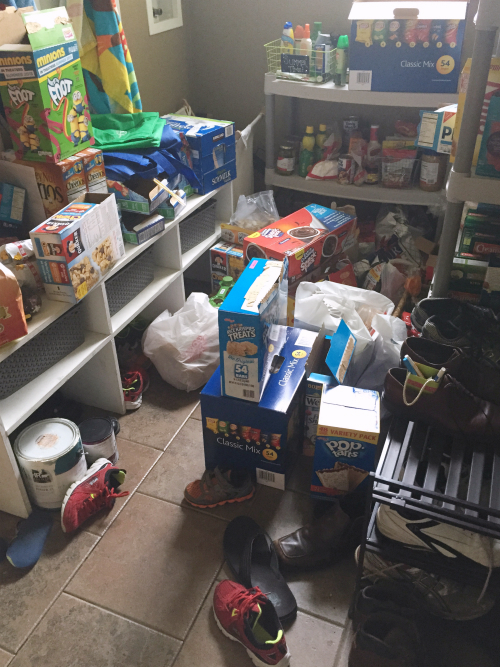 I want a pantry this big! 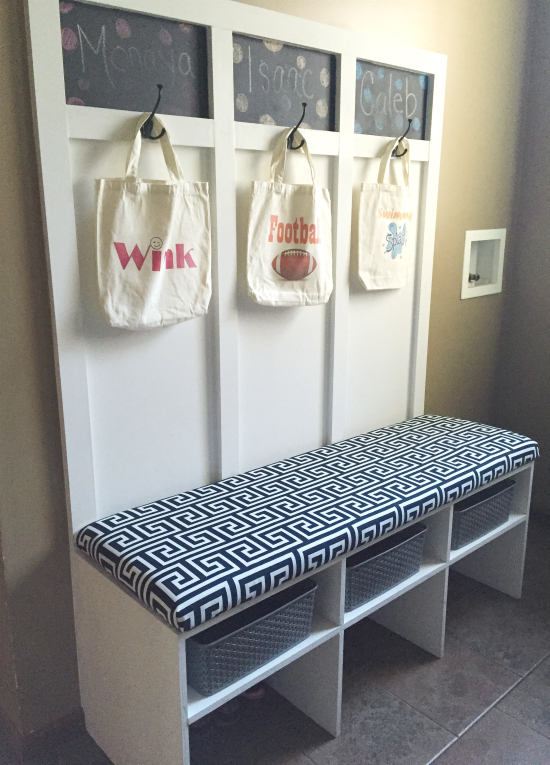 I adore that bench you made, and those buckets painted gray are such a good idea. Thanks Emily! 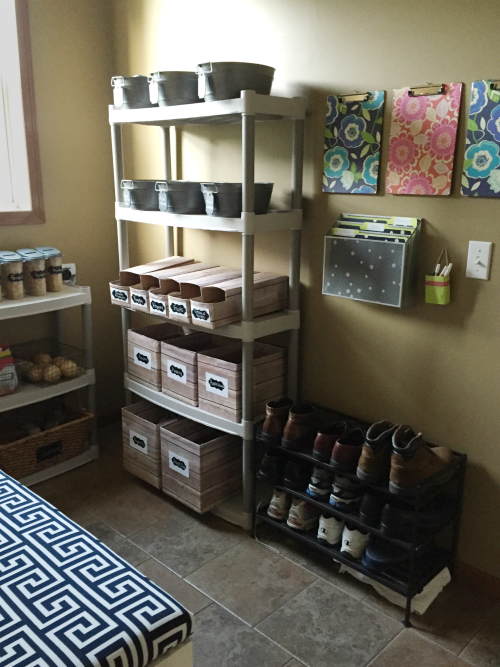 This is technically the mudroom, and we needed more storage for food, so we made it a little bit of both. Thanks for stopping over! You did all of this for under $100? I am amazed and inspired! Thanks Heather! Super grateful for coupons!